This walk is well known as a training track as it has over 1000 steps to give you a good workout. It’s another walk covered in Top Walks in Victoria by Melanie Ball. The walks climbs up often using stairs and there are signs warning users not to jog along the track. But despite this many people quickly jog and run up and down the track; including one young mother with her baby attached to her front; quite dangerous I think. 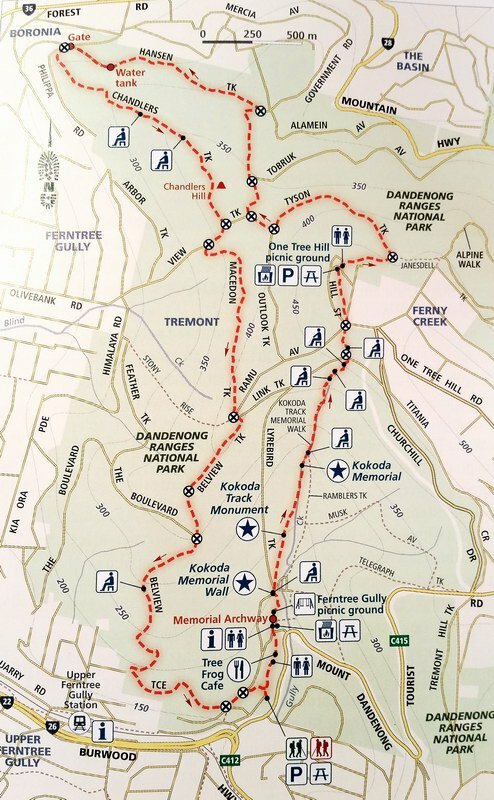 The book’s 10km version of the walk includes a northern loop. Once you get to the top of the climb the best scenery is behind you. Most walkers return by the same way or via Lyrebird Track. We picked up the book’s walk by cutting the top loop using Ramu Avenue and then turning left onto Belview Terrace, making it just over 5km for the day. The scenery along here is nice but the best is along the 1000 steps section.